Trey Bedosky, a Landmark Christian offensive lineman who is a rising senior, has recently seen an upsurge in offers with Tennessee-Martin being the latest. 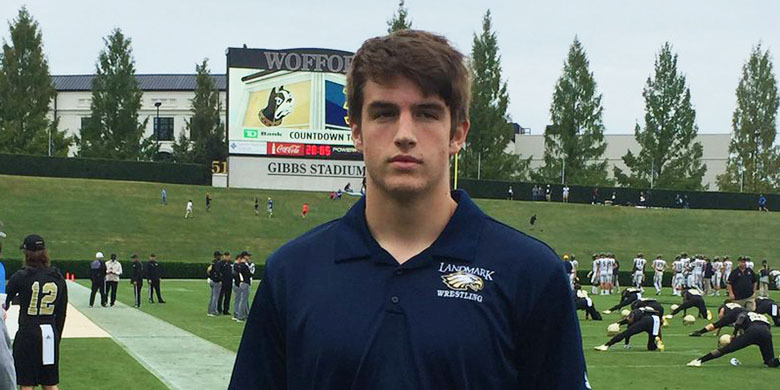 The Class of 2020 athlete stands at almost 6’7″, which is certainly tall, even for a player who mixes it up in the trenches, so colleges are obviously encouraged by his perceived upside from his size alone, but there is more. Bedosky is the area champ in wrestling at the heavy weight class this offseason, which bodes well with how he is continuing to fill out his body. Over the last 15 months, Bedosky has added about 50 lbs to his frame, and at 250 lbs., he still has a long way to go until he is done filling out, but colleges should be encouraged in the direction he is going. His recruitment is also going in the right direction too, and now including his UT-Martin offer from today, Bedosky sits at 4 total with Tenn Tech, UT-Chattanooga, and Eastern Kentucky as well. I’m surprised to see that more high-academic schools, specifically Ivy Leagues have yet to offer the high-upside linemen, but evaluation period is still going strong. Bedosky takes his studies seriously, and has a 4.14 GPA, which is no easy task at a strong academic school like Landmark Christian. He has also tested out well with a 25 on the ACT. Bedosky is just scratching at the surface at his potential. His junior film showed good progress with how quickly he engaged with the defender and the nice leg drive he showed. Considering his height, Bedosky has solid flexibility, but still needs to improve his pad level so he can better leverage. His upside is more as a pass-blocker at the next level, he made 2nd team All-Region as a junior, and I think all things considered, Bedosky is set for a big senior year, and he is a 2020 recruit to target during the 2019 season. For now, expect more offers coming in from D1 schools all around. Spring practice period should pay dividends when college coaches can see the 2020 recruit in action, and determine how he fits their scheme. Interested in recruiting Trey Bedosky, click HERE to visit his Recruit Georgia Profile and be sure to follow @RecruitGeorgia on Twitter to hear the latest recruiting news around the state.